Eat brains. Don't get shotgunned. 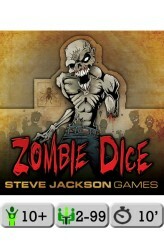 In Zombie Dice, you are a zombie. You want braaains – more brains than any of your zombie buddies. The 13 custom dice are your victims. Push your luck to eat their brains, but stop rolling before the shotgun blasts end your turn! Whoever collects 13 brains first wins. Each game takes 10 to 20 minutes and can be taught in a single round. Each turn, you take three dice from the box and roll them. A brain symbol is worth one point at the end of the round, while footsteps allow you to reroll this particular dice. Shotgun blasts on the other hand are rather bad, cause if you collect three shotgun blasts during your turn, it is over for you and you get no points. 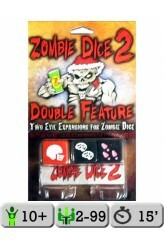 After rolling three dice, you may decide if you want to score your current brain collecti..
Zombie Dice 2: Double Feature includes three new dice for Zombie Dice and – true to its name – is two expansions in one package. The first "movie" on the billing is Big Summer Action Movie with two heroes: the Hunk and the Hottie. The Hunk has a double-shotgun icon, but if you eat his brain, you score double. The Hottie is a hot-pink die with two shotguns and three feet icons, making her fast AND dangerous. The other offering is Santa Claus Meets the Zombies, with a cheery red-and-white Santa Claus die brimming with brains. The Santa die has three special gift icons: a helmet, an energy drink, and a double brain! You can also add all three dice to see whether Santa can rescue the heroes in The Direct-to-Video Sequel. 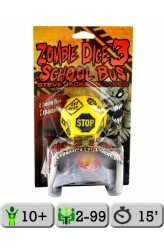 https://youtu.be/N6CoDg4eaQU ..
Zombie Dice 3: School Bus, an expansion for Zombie Dice, adds a 12-sided die to the game that's rich with tasty teenage brains, jam-packed with nutritiousness from all their time at school — but those kids are packing shotguns, too, so you might find yourself chowing down on a brain bullet, chasing runners off the bus, getting run over the bus(! ), or finding yourself on the receiving end of multiple shotguns. https://www.youtube.com/watch?v=UeUOf-JTeZA ..